Orlando is predominantly known for being a famous tourist destination, making it one of the most visited cities in the world. Almost 70 million people travel there a year due to its’ numerous attractions, but not many realize it's also one of the world’s busiest cities for conferences and conventions. Orlando is home to the second largest convention center in the country as well as countless other gathering facilities. When attempting to select business event venues in Orlando, the number of options can be quite overwhelming. 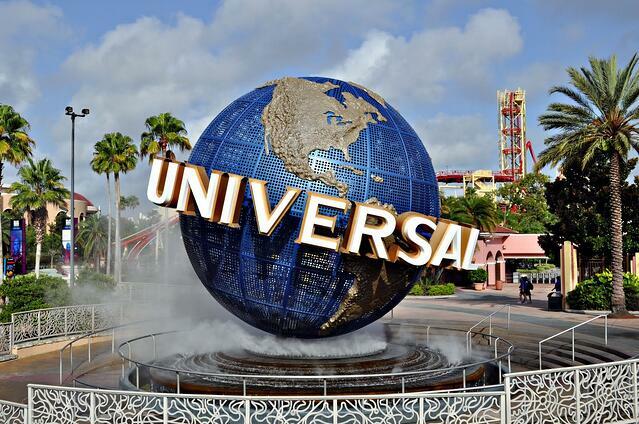 That’s why we’ve put together our list of some of the best options in Orlando. Opening in 1983, the Orange County Convention Center has hosted local, national, and international conventions, meetings, trade shows, concerts and events. Along with an impressive total square footage of 7 million, it also boasts 2.1 million square feet of event space, making it the second largest convention center in the country. The convention center accommodates well over 80,000 seated and 100,000 standing, featuring meeting rooms, theatre spaces, outdoor spaces, lecture halls, general assembly areas, and even ballroom areas. If you thought that was something, the amenities are just as vast. Replete with the most up to date technologies, the facility has Wi-Fi throughout the center, is handicap accessible, includes in house utilities, a business center, high power outlets, teleconferencing, security, on-site parking, 2 full service restaurants, 8 food courts and is connected to 4 world class hotels by covered walkway bridges. The center is located 15 minutes from Orlando International Airport and is conveniently surrounded by Orlando’s premier tourism and business district. There is never a shortage of fine dining, shopping, and activities for the business traveler or family. Pricing and amenities for the center is available upon request and on their website. 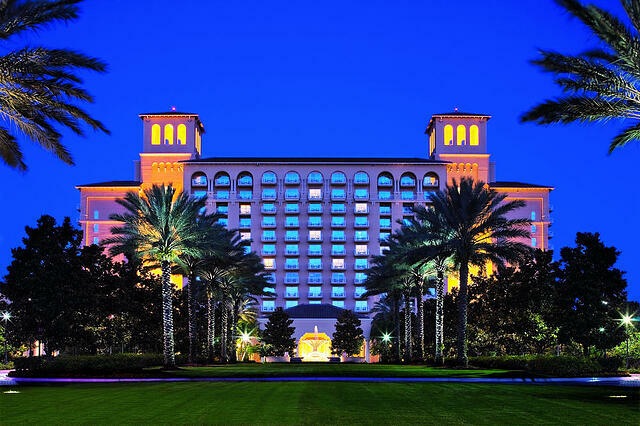 A comprehensive meetings and events hotel, the Ritz-Carlton offers its’ guests and business travelers some of the best rooms and facilities in Orlando. The Ritz-Carlton is an oasis getaway nestled between world renowned theme parks and preserved natural habitats. Some of the amenities include: 582 guest rooms, 11 fine dining options, a fitness center, the award winning 18-hole Greg Norman-signature golf course, and their business center. The Ritz-Carlton delivers 47,000 square feet of indoor meeting space with an additional 100,800 square feet of flexible indoor meeting space at the adjoining JW Marriott. Their meeting room details and services are listed on the hotel website. No matter how small or large your gathering is their team of experts are more than willing to help plan every detail of your event from audio-visual, to special requests during the meeting. For those who enjoy discussing business over a good game of golf, Lake Nona Golf and Country Club is the place to meet. The world renown award winning private club is a favorite among many professional golfers. Located 20 minutes from downtown Orlando, the residential golf community offers an 18 hole championship golf course, 40,000 square foot clubhouse (with an 18 room guest lodge), gated security, fine dining, and a fitness center. The meeting and event spaces within the clubhouse can comfortably accommodate up to 200 guests. Whether for personal celebrations or business retreats, their professional staff is on hand to cater to your every request. All food and beverages are in house with complete audio/visual services available. Pricing can vary widely depending on your requirements. For the coolest corporate event in town, Icebar Orlando has you covered. Icebar Orlando is located less than a mile from the Orlando Convention Center. For groups of 10 to 1200 they have 5100 square feet of floor space with flexible buyout opportunities for business events. A media wall, multiple screens, and a presentation ready sound system awaits you. They also offer in-house catering, full bar options and free parking. The bar is made with over 70 tons of hand carved ice. Only 25% of the building is kept below freezing and coats and gloves are provided at no extra charge. Buyout minimums of $5000 Monday-Wednesday, $7000 Thursday and $15,000 Friday and Saturday with food, beverage and ice bar entry apply. 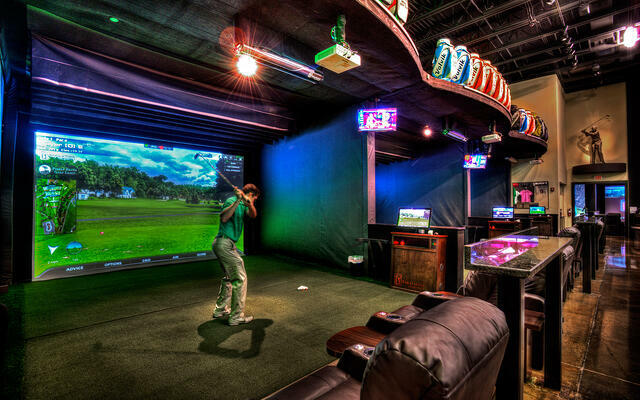 Dewey’s Indoor Golf & Sports Grill is a 12,000-square-foot indoor high-end sports grill that features high tech golf simulators, 75 to 100 televisions (including a 25 foot screen), meeting rooms, a Vegas style bar and lounge, as well as in-house catering with extensive menus options. Equipped with full A/V capabilities, Dewey’s serves groups from ranging from 10 people all the way to 800. Located on Orlando's “Restaurant Row”, it offers flexible buyout options and exclusive private rooms available on request. Heaven is a modern upscale event venue which contains over 12,000 square feet of flexible indoor/outdoor space awaiting your arrival. Heaven has been constructed with state of the art equipment and is positioned approximately 15 minutes from downtown attractions and the Orlando International Airport. The setting is outfitted with some of the latest in technological advances, and AV packages are all customized based upon need. Experienced professionals and an open vendor policy make it easy for you to you create a truly unique affair for up to 350 guests. Only one event is booked per day with VIP rentals, exclusively giving your party a full 12 hours to enjoy the surroundings. Average events cost anywhere from $1500-$3000 based upon requests. Located in Orlando’s historic College Park neighborhood, The Acre is literally one acre of open rustic space to fill with creativity. The area is equipped with a full kitchen, sound and audio equipment, lights, and has access to catering, table/chair rentals and more. 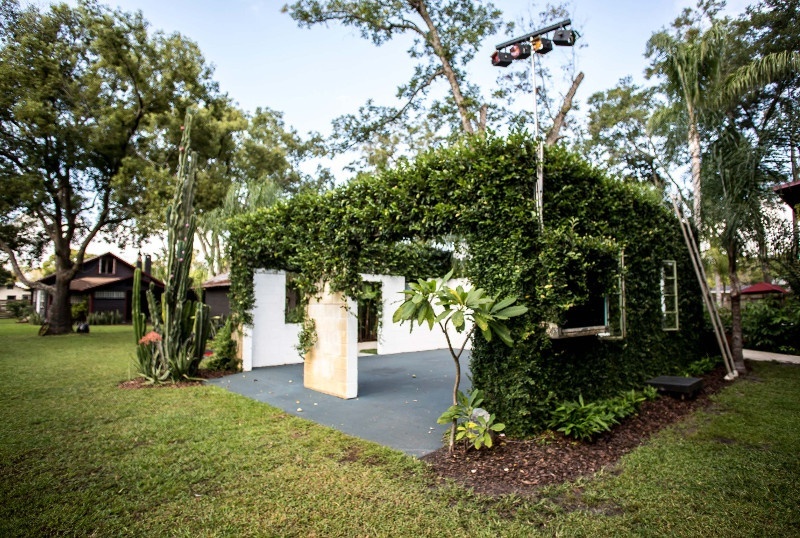 Amidst indoor and outdoor spaces, the setting can accommodate events both large and small. All corporate events are priced on an individual basis. Penthouse 450 is a sophisticated 2,600 square foot space surrounded by a beautiful balcony overlooking downtown Winter Park. Located just 10 minutes from downtown Orlando, it provides an open floorplan for small private functions. TV’s are mounted throughout the area for easy accessible use. Amenities include: A/V equipment, wi-fi, indoor/outdoor speakers, food drop area and bar, street parking and much more. Catering and other event services are available, with quotes given upon request. 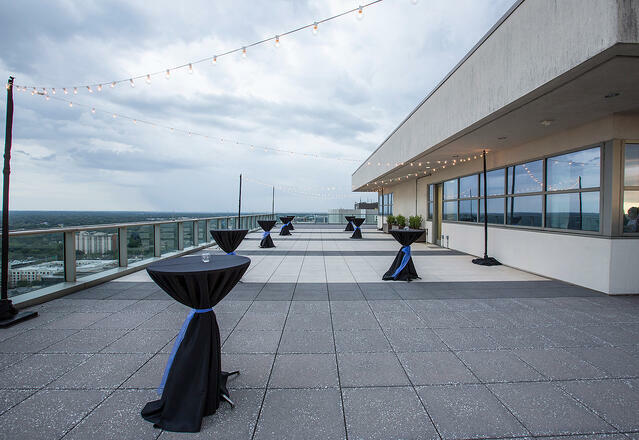 The Rooftop is one of the most unique and exclusive event venues in Orlando. 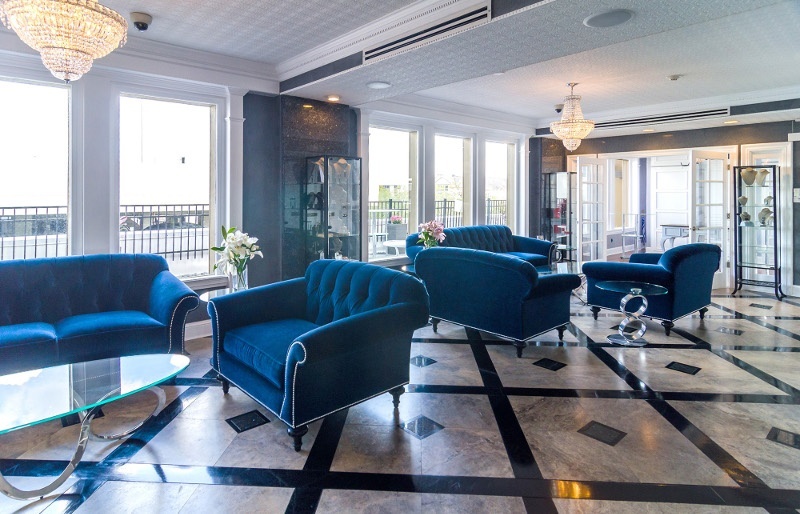 Accommodating up to 200 people, The Rooftop is situated in the heart of the downtown area. The 10,000 square foot outdoor space is open air and offers paid garage parking, bus drop off near the elevators, as well as catering and beverage services. A/V services may be available upon inquiry. Space rental for 6 hours is $3500 weekdays and $4500 weekends plus additional fees for food, beverage and requests. These are but a few options of what Orlando has to offer. Once you’ve decided on a venue, all that’s left to do is sit back, relax, and leave the driving to us. Looking for more information on transportation for your event? 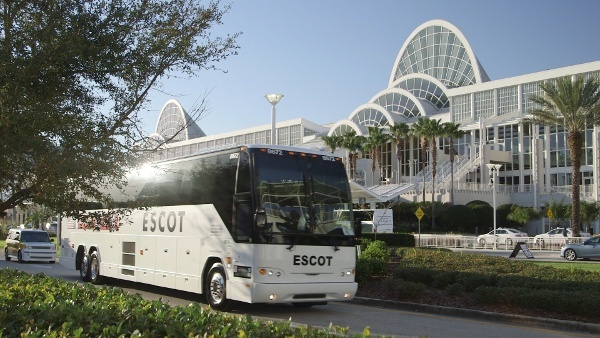 Check out our Orlando Charter Bus Location Page and our Convention and Event Page for more info on high quality group transportation options for your event. Ready to get your transportation quote?  Click below to get your group's charter bus transportation quote today! How was your bus experience with ESCOT Bus Lines? We'd love to hear about it. © 2019 ESCOT Bus Lines. All rights reserved.